Guild Master in Champion's Guild. 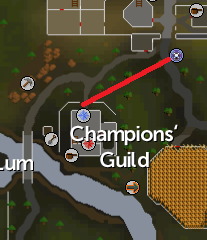 To start off, talk to the Guildmaster in the Champions' Guild just southwest of the Varrock lodestone. Ask for a quest. He tells you that you must go to Oziach to find out your quest. Oziach lives North of Edgeville's lodestone. When you reach Oziach, talk to him. Ask Oziach if he can sell you a Rune Platebody. Then tell him the guildmaster sent you. He will become defensive, so tell him you thought he would give you a quest. He will tell you to slay the dragon of Crandor. Respond by saying it sounds like fun. Now you need to go back to the Guild Master. He'll tell you it might not be as easy a task as first thought. He'll fill you in a little on the dragon's past. You will be presented with a bunch of questions to ask. Ask all of them. The Guild Master tells you that the map was split into three pieces. Now ask where each map piece is. Melzar locked himself up in a castle near Rimmington. Unfortunately, the map piece is with him. Head to Rimmington and enter the maze with the key the Guild Master gave you. If you have lost your key, you can get another from the Guild Master. While you go through Melzar's Maze you will have to kill certain monsters to get keys. These keys open doors which will lead you through the maze and to the map piece. You will come across monsters that are mostly weak to magic spells however any combat style should work here. Make sure you have one open inventory space to pick up the keys before you head in. Kill the Zombie rats until they drop a red key. The rat which drops the key is smaller than most, and has a longer tail. It respawns towards the north of the room. 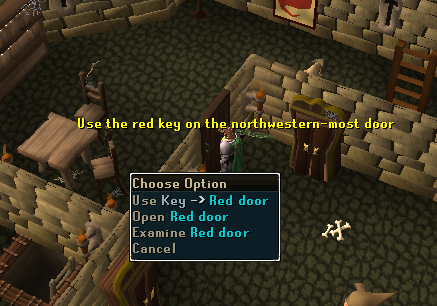 Use the red key on the northwest-most door to unlock it. Now go up the ladder to reach some level 18 ghosts. The ghost which drops the key appears to be female and has long, waving, hair. Kill the ghosts until they drop an orange key. Use this key on the second orange door from the north on the eastern wall. Go up this ladder, too. Kill the level 18 skeletons in this room until they drop a yellow key. The skeleton that drops the key wears a small round buckler, coloured black. Use this key on the western-most door on the southern wall to unlock it. Walk through the "L" shaped room and go down the ladder. Go down the other ladder in the next room, and a third ladder in the room after that. Kill the level 20 zombies to get a blue key. When it is dropped, go through the only blue door there. Next you will have to kill Melzar himself. Melzar the Mad is a crazy level 56 wizard with no weakness. He has no specified weakness and will randomly summon cabbages. You should be able to extinguish him easily. He will drop a magenta key. Go through the magenta door. You're now in the final room, which contains a lesser demon. Most lesser demons in RuneScape are level 100, however this one here is a bit more lesser and is level 80. The demon attacks with magic, although you should be able to manage using melee attacks. Kill the lesser demon and pick up the green key it drops. Use the key on the green door and you will be in a room with a chest. Open the chest and you will get a map piece. From here you should lodestone teleport out or head up the ladder and exit through the entrance. 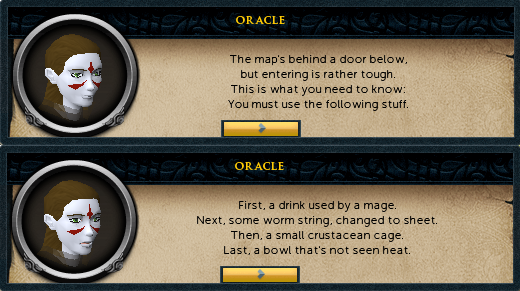 Once you have these items go to the Oracle. 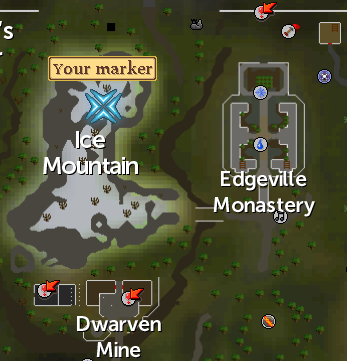 She can be found on Ice Mountain, west of Edgeville. Talk to her about the map piece. She will give you a riddle. The door she talks about is in the Dwarven Mines. To get there, walk South to a building complex. Go down the ladder in the middle of the buildings. Follow the route shown to arrive at a door. Use each of your items on the door to enter. Search the chest in the middle of the room for the next map piece. Lozar was recently killed and her map piece taken by goblins. One of the Goblin's in Goblin Village is likely to have it according to the Guild Master. A quick look around Goblin village will reveal that the piece is not in fact there. The goblin who has the piece is now in Port Sarim's jail. His name is Wormbrain and he is in the cell highlighted green in the picture above. There are two ways to get this piece, depending on your magic level. Go to the jail with 10,000 coins and talk to Wormbrain. Tell him he has a map piece you need. He will ask what you will do for it. Say you will pay him. Once he names his price of 10,000, say okay. You will now have the piece. Go to the jail with enough magic attacks to hit 50 damage and an air and law rune. Kill Wormbrain and telegrab the map piece. Congratulations! You now have all of the map pieces. Use them on each other to form the whole map. Getting the protection comes in the form of a shield. This one is easy to get. You simply need to go to the Duke of Lumbridge. To get to Lumbridge, cast Lumbridge Lodestone Teleport. From the castle courtyard, go up the stairs on either side of the castle. The Duke is in the room with the quest symbol. Talk to him and tell him you need a shield that will protect you from dragonbreath. 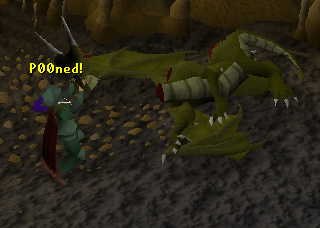 When he asks what dragon you intend to slay, choose the Elvarg option. The Duke will fill you in a little on the dragon's past. When he's done, ask for your shield. He will give it to you. In case you die while fighting the dragon later on, get a few extra shields from him. 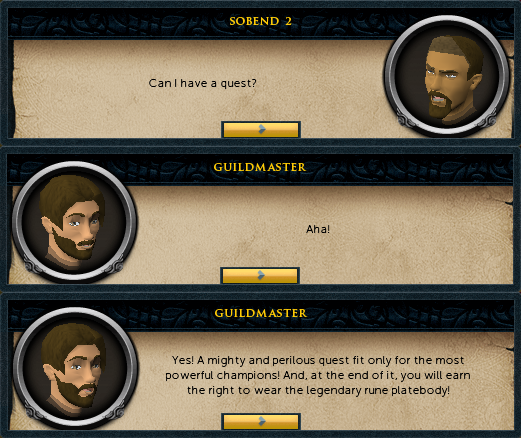 Head back to the Champion's Guild and speak to the Guildmaster about finding a ship and a captain. He will suggest you travel to Port Sarim as there is probably a ship for sale on the docks. 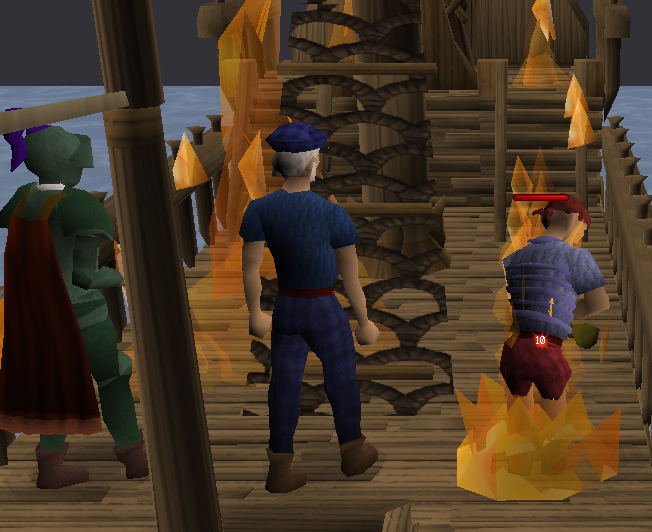 Talk to Klarense on the Port Sarim docks. He is in the area circled below. Talk to him and he'll talk about a ship. Say you'd like to buy it and he'll ask for 2,000 gold pieces. Accept his offer. With three Planks and 90 Steel Nails, go down into the lower part of the ship. Click the hole on the southern side of the ship to repair it. Your ship is now sea worthy. You also need a captain to take you to Crandor. 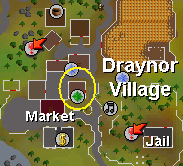 He is in the circled house in Draynor. Talk to him. Ask if he can take you to Crandor. It looks like Ned has caught onto the #YOLO trend! You'll tell him to go wait at your ship and he'll go. He will also take your map. Now, it is time to kill the dragon. For years, countless of boys on junior high school campuses have dreaded over "that green dragon" and their inability to beat her. Unfortunately for them, they never managed to find this guide and will never taste the glory you will in about 25 minutes. They will probably have deep regrets about this into their mid 60s. To avoid having deep regrets into your mid 60s, you are going to need to do some things first. For one, you should know a little about your enemy. 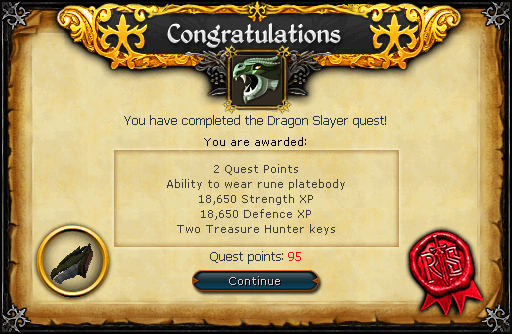 Elvarg is a level 63 dragon. Like many bosses she has no listed combat style or weakness, so theoretically the three styles of combat will be equally effective. Second, you're going to need to gear up properly. Even though she was released well over 10 years ago, Elvarg still gives people trouble today. Obviously you are going to need a anti-dragonfire shield or else you'll be toast. You will also need at least medium strength weapons and armour. Tier 30 (such as mithril) should be fine, but anything below is going to be pushing it. Also, you should pick the correct combat class. For most of the people doing this quest, melee is the best way to go. Despite having no listed weakness or strength, Elvarg has a much stronger magic defense than melee defense. Range can be an option. Freeplayers, while not having access to strong crossbows, can have access to javelins. However most low leveled players aren't going to have a significant enough range level to make this work. So melee is the way most people should go. After worn equipment, you should focus on your inventory. Lobsters are probably the best choice in this situation even though tuna will likely be passable. If your hitpoints are very low Salmon may be the most cost effective food since Tuna and Lobsters will not heal you to their full potential. You may also bring attack, strength, and/or defence potions if you feel it is necessary. Once you have all of this sorted out it is time to get to Crandor. 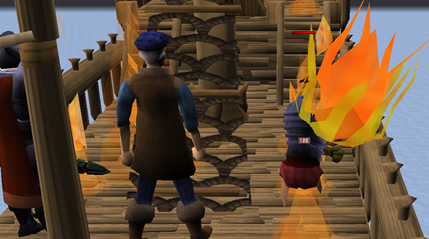 Head to the ship you bought in Port Sarim and board it. Speak to Ned and you will begin your trek to Crandor. Right before you are about to land, Elvarg will come out of her lair and put on a show. In what is a sign of (hopefully) things not to come, Elvarg will burn your ship and kill Cabin Boy Jenkins in the process. Following this cutscene you will be on Crandor. 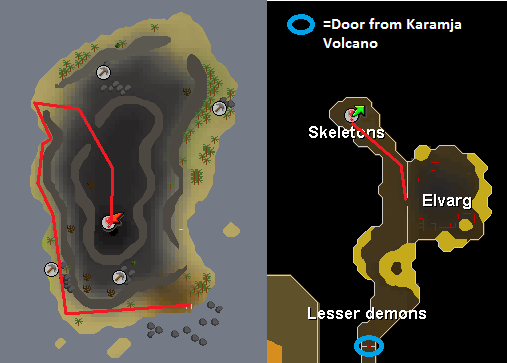 Follow the route below to get to Elvarg. Climb over the stalagmites and engage in battle. Elvarg has both a strong dragonfire and melee attack which will routinely hit 200-300. However, the biggest issue with Elvarg is her attack speed, which is equivalent to the fastest weapon speed (a dagger, scimitar, shortbow, wand, etc.) To prevent any mistakes, keep your hitpoints high. As for abilities, the "kick" and "backhand" abilities are particularly useful and since Elvarg cannot be stunned will inflict large amounts of damage. Other than that, persistence is key. If you need to, you can run out and end the fight early. From there you can walk back up to Crandor and lodestone teleport out. If you are following the advice listed here and still having trouble, check out the Extras section for more hints. When you kill her, you will automatically cut off her head. After the quest you can wear the tier 50 body armour (given you have the required skills). Each piece has 195 armour bonus. 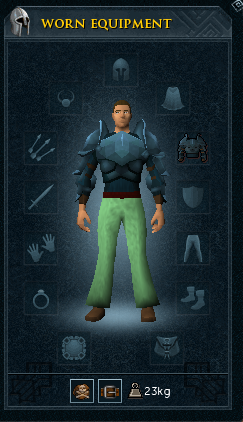 Now that you're an expert dragon slayer, you can wear rune platebodies. They require 50 Defence to wear. 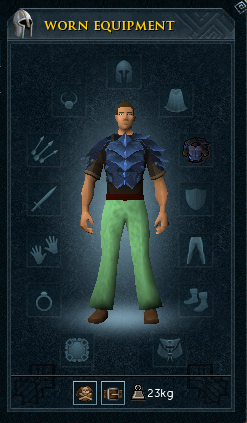 You also gain the right to wear a Blue D'Hide Body for slaying the dragon. 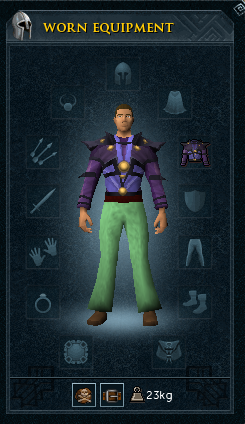 It requires 50 Ranged and 50 Defence to wear. Finally, you get the ability to wear the head-turning (okay, not really) Batwing Torso! It requires 50 Magic and 50 Defence to wear. Still having trouble defeating Elvarg, despite our expert advice? Well, there are two ways pretty much anybody can beat him however they both require a friend. The first way involves getting a friend to drop food outside of the battle area (food cannot be traded because the skeletons outside are aggressive and will disrupt trading). When you run out of food simply head outside, pick up the food, and continue. However you may have to do this quickly since Elvarg's life points may regenerate. The second method involves having a player who has not done the quest to weaken Elvarg so she will be easier to kill for you. Again, attack her quickly afterwards so she does not regenerate life points. Rings of Recoil (members only) can theoretically be used to help damage Elvarg, however normal players are better off with other rings (such as a Ring of Life). [^] Ask the Guildmaster about the map. 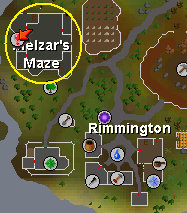 [^] Head to Melzar's Maze in Rimmington. [^] Obtain a Red Key by killing rats and use it on the most Northwestern door. [^] Obtain an Orange Key from ghosts and use it on the second door from the north on the east wall. [^] Obtain a Yellow Key from skeletons and use it on the western-most door on the south wall. [^] Go down a few floors and obtain a Blue Key from zombies, then use it on the blue door. [^] Defeat Melzar and take the Magenta Key. Proceed through the magenta door and kill the lesser demon. Take his green key and use it on the green door. [^] Loot map piece from chest. [^] Speak To the Oracle. [^] Head to the Dwarven Mines. [^] Open door and loot map piece. 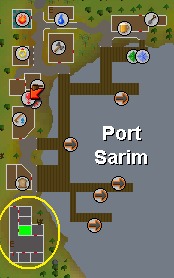 [^] Obtain the Map Piece from Wormbrain in the Port Sarim Jail. [^] Speak to Duke Horacio about dragonbreath protection. [^] Talk to Klarense on the Port Sarim docks. Then fix the boat. 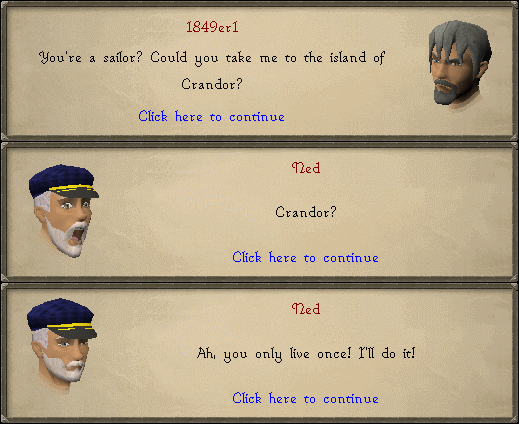 [^] Talk to Ned in Draynor. [^] Take the ship to Crandor. [^] Show Elvarg's head to Oziach.